The role of information in services marketing information has been recognized as a key element of most services. However, information has been generally viewed as a way to support the basic service and to enhance performance rather than a central focus for segmentation purposes. In the traditional view, information is generally classified as one of eight supplemental services (along with order taking, safekeeping, billing, consultation, hospitality, exceptions and payment) and seen as essential if customers are to obtain full value from any good or service. Most research on the role of information in services marketing has focused on the technology issues involved in developing effective information collection systems, rather than on how information can best be used to gain competitive advantage in the marketing of services. Information technology can be used to increase the tangibility of services, as well as a tool for analyzing customers' purchasing habits and altering marketing strategy. Competitive success is often determined by "incremental differences in companies' abilities to acquire, distribute, store, analyze, and invoke actions based upon information". This ability to manage and effectively use information technology is considered especially important as the market moves further into the era of the virtual business. With information on products and services becoming instantly available to customers and competitors, it will become increasingly important to develop new strategies of differentiation and to develop strong bonds with customers to offset the "increased pressure of commoditization" (Emmelhainz and Kavan, 1999). While important in a supporting role for many types of services, information is the core service in a number of industries. Services are classified into four categories based upon the type of service provided and the recipient of the service: tangible actions to people's bodies, tangible actions to physical possessions, intangible actions directed at a client's mind, and intangible actions directed at intangible assets (Emmelhainz and Kavan, 1999). The latter category, which includes financial services, along with accounting, law, management consulting, medical diagnosis, and the like, is referred to as information processing services. The service sector, where information is the service is sizeable and it is predicated that by 2000, 44 percent of those employed in the service sector will be working in the information area (Sisodia, 1992). In these industries, the critical aspect of information is not so much the effective use of information technology to acquire, store and analyze data on customers, but rather the understanding of and ability to respond to differing information capabilities and needs of customers. Here the focus is on using information needs as a way of building customer loyalties, increasing customer involvement in the service process, and strengthening customer relationships. In other words, information is becoming an essential element for successful relationship marketing (Emmelhainz and Kavan, 1999). B2B service marketing has received comparatively less attention in the academic literature than B2B product marketing; much of the service marketing literature discusses the ways in which services and products are different. Compares service marketing to product marketing in the industrial sector from the perspective of customer value creation (Gordon et al., 1993). 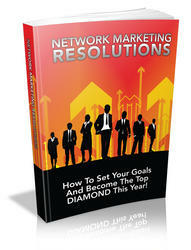 Learning About Network Marketing Resolutions Can Have Amazing Benefits For Your Life And Success. How To Set Your Goals And Become The Top DIAMOND This Year.